Apple, a temperate crop, is being cultivated as a cash crop in south-western Ugandan highlands, where farmers are successfully cultivating it. According to reports, till recently only a few countries in Africa were known to produce deciduous fruits substantially. But studies show that the consumption of deciduous fruits, especially apples, is increasing in the continent. At present, apple production lies with small-holder family farmers and they are commercialising it in the highlands of Kabale in south-western Uganda. To support them, the government of Uganda has launched a number of initiatives. One such step is the promotion of commercial apple development under the Plan for Modernisation of Agriculture. It is an initiative for increasing farmers’ income. A successful transition to agricultural growth in Uganda depends on how effectively many farmers can move out of subsistence agriculture and take over commercial agriculture in a sustainable manner. Currently, the Uganda government is promoting apple production under the National Agricultural Advisory services programme in the highlands of Kabale, Kisoro and Kanungu districts. Commercial production of apples is a recent development in Uganda. An important reason driving apple yields is the suitable climatic environment in the cool highlands of Kabale, Festus Akinnifesi, sustainable agriculture, Food and Agriculture Organization, said. Like most of Africa, Uganda is vulnerable to climate change with rainstorms, heat waves, drought and floods affecting people. These factors have put extra pressure on the agribusiness sector to generate employment opportunities in the rural areas. The low capacity of Uganda to adapt to the impacts of climate change has been attributed to limited options for livelihoods and limited knowledge on climate change mitigation plans. But apple production is not a panacea and its commercialisation alone cannot solve problems of hunger. But, it has the potential to make a major contribution to poverty reduction and improved nutrition. “What is needed is diversification of livelihood opportunities. Apple commercialisation is a good option in this respect. Apples are high-value perennial fruit trees of commercial, nutritional and environmental importance, if included in farming systems. It can help diversify income for farmers, and improve their capacity to adapt to climatic extremes affecting the annual crops,” the FAO expert said. Though apple production in south-western Uganda is a profitable venture, there are still major limiting factors such as intensive labour and inadequate experience of farmers. As with most horticultural fruit trees, commercial apple production is both knowledge and labour intensive. Farmers need to know how to manage trees, soil, water and grafting techniques as well as how to tackle pests and diseases. All these require labour and knowledge. However, the advantage of apples over annual crops is that once established, farmers do not have to replant trees for a long time. The cost of tree establishment is a one-off, but management is a continuous process. Another challenge is that many farmers are struggling to commercialise apple crops due to poor quality. The local varieties are less preferred at markets, as they are poor in taste. Hence, they are not able to compete with imported fruits. 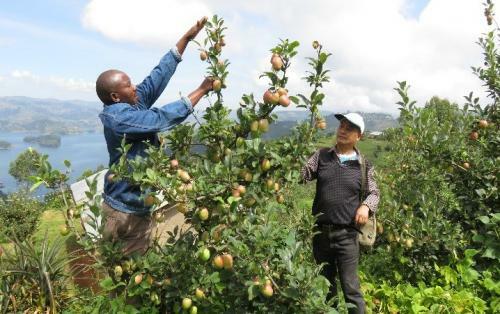 Introduced in the African country as part of the South-South cooperation with China, studies show that the apple fruit is slowly adapting itself to the African soil. “The South-South Cooperation (SSC) has become an effective instrument for catalysing agricultural development, thereby expanding potential opportunities for collaboration and sharing of resources in the global South. It is based on the premise that development solutions in the South are developed under similar environments, and sometimes socio-economic circumstances, and can be shared. Such sharing can help developing countries jump-start agricultural transformation and benefit from innovations, lessons and good practices that have been tried and tested elsewhere in the south,” Akinnifesi said. 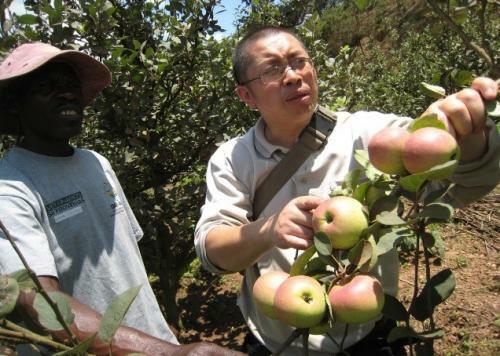 According to experts, the China-Uganda tie-up has helped farmers overcome key technical problems relating to nursery management, propagation systems; especially grafting, tree management, soil management and affordable means of controlling. Farmers have now taken these skills beyond the ‘proof of concept’ stage and actually reaping profits. Liu Zhongwei, the project manager of the China Trust Fund, an umbrella project involving several countries in Africa, has been quoted as saying elsewhere, “Based on the early success of phase 1 of the China-Uganda project, both countries agree that SSC can be an important vehicle for promoting sustainable agricultural production. The second project phase started in January 2016, focusing on cereal production, horticulture, aquaculture, livestock and agribusiness.